Rabat---The Moroccan Confederation of the agricultural sector and rural development (COMADER) held its first general constitutive meeting on Saturday at the " Institut agronomique et Veterinaire Hassan II " in Rabat. The confederation, which groups several professional associations in the field of agriculture, aims at creating a space for dialogue for agriculture professionals; providing a strong coordination body for all the operators of the agricultural sector and the rural world. It also aims to present a dynamic and reliable communicator to all public administrations to accompany reforms in the sector; defend the interests of the people working in the agricultural field; and contribute to all the agricultural and rural development actions. "After the natural disasters (drought, locust invasions, floods) that the agricultural sector have faced during the past years, and after assessing the situation of the sector in the light of globalization and free trade agreements, we have decided to create an organization which groups all the professional associations in the agricultural sector to face these challenges,” said Ahmed Ouayach, coordinator of the organization committee. Several of these professional associations met last year to evaluate the situation especially the negative repercussions of the natural disasters on the income of the Moroccan farmer. The meeting was an opportunity for them to look at future prospects of the agricultural sector. “We have noticed that things are not going on the right path. This requires that all the agricultural operators and public authorities take firm and efficient decisions to face the current situation,” stressed Ouayach while describing the problems facing the sector. He added that the deep transformation in the global economy strongly affected other economies in the developing countries, including Morocco. These changes make the professionals put the upgrading of the agricultural sector a top priority in order to face the new international competition and to answer consumers' quality demands. 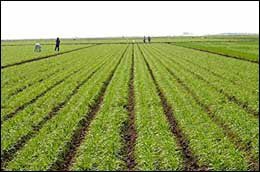 “The upgrading will certainly allow the national agricultural sector enjoy a salient economic position within the Moroccan economy,” Ouayach affirmed. Ouayach recalled that the recent “human development report on the 50 years after the independence”, which unveiled the agricultural situation in Morocco, insisted on the necessity to involve the human capital under a new concept that will focus more on a participatory approach. In the same vein, the Minister of Agriculture, Rural Development and Sea Fisheries, Mohand Laenser, who encouraged the creation of the new confederation, highlighted the importance of the professional associations in the development of the agricultural sector. Speaking at the confederation's general assembly, Laenser said that the development of the agricultural sector needs a well studied and comprehensive view of the professional work based on a state's clear strategy. The minister said that the state's strategy is based on four axes, first of which is to encourage the creation of the professional associations in the field of agriculture for the structuring of production chains. The state, added the minister, seeks to support the programmes of these associations within the framework of a cooperation partnership, involve them in the study and the setting up of agricultural policies in order to open a direct dialogue with them, and promote their negotiation capacities in representing the sector. “There are currently more than 400 professional association in the field of agriculture, and more than 1000 associations of users of irrigation waters. We consider the achievements of some of them an example that is worth encouragement and support,” stressed the minister. COMADER's meeting was attended by several professionals in the agricultural sector, members of the parliament and journalists.